To login to DREAMT FOREST is gets a bit technical. Think back as you installed Microsoft Word or Photoshop for the first time and you got your first lines nicely formatted for print — or you made a frame for your first picture. Later you say: it is easy. Same here ! Now some information to you, the “n00b” – the newcomer. Technology background: In 2004 Philip Rosedale aka Philip Linden set the code he developed at Linden Lab on opensource licence [as he used opensource technology]. From this source opensimulator developed and moved up over the years — now many universities use it – most of them located in USA and Australia. We made this technology usable for art and for art conservation. There are many aspects to be taken into consideration – security, maturity rating, stability, ease of use — use at schools and in classrooms on stand-alone servers. Art conservation: This installment shall be conserved for future generations as it is for the first time a virtual world was accepted within the framework of a real bienniale – scope “mixed media”. But for now DREAMT FOREST needs to be filled with tons of trees and visitors – you know the number 1668? When you are new to a walkable 3D Environment with Avatars as you see in the Videos then I recomend you name yourself “Newxxxx Visitor” or “n00bxxxx Visitor” – then all see you might need help. Also enter a valid correct email when you Register your Avatar. You get the download link for the viewer via email and an explanation “how to install”. Here you see a chart made for a NGO project conserving a “real park” – your installation works similar. The advanced visit: Step in as a planter. Name yourself “First name” Planter. Then plant a tree. Take it from the box the recently arrived inhabitant of DRON7 holds in hand and plant it in one of the dedicated plots. Then water it by touching. Make a note on your tree. Each tree has a number. Come again later and water your tree again. After a few days it might have grown nicely and is ready to the transfered to DREAMT FOREST. For this call a Gardener. The Gardener will help you doing the hard work. Then make a photo: you, your tree and the gardener. There is a story behind … even a story writing contest where you get paid in case your story gets published. 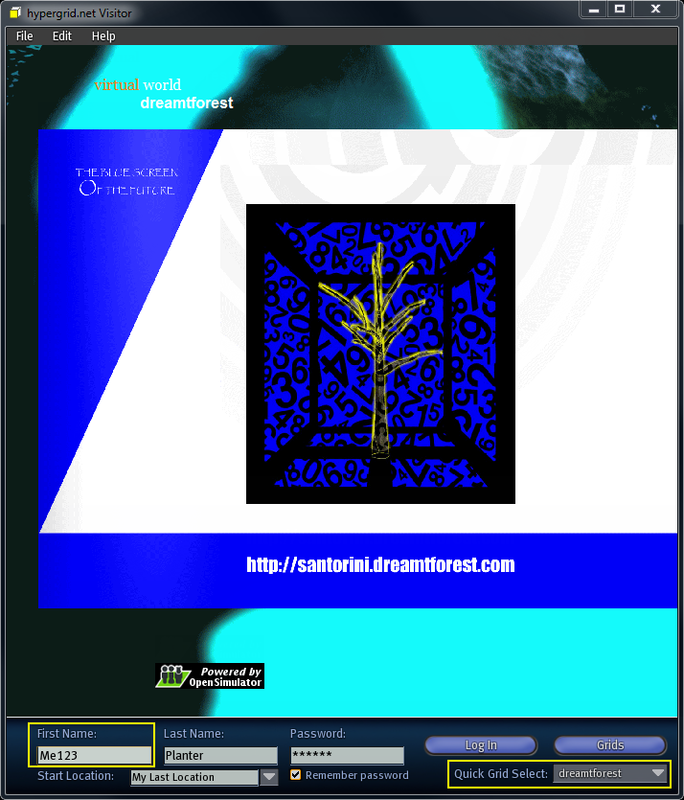 About user names: The private grid DREAMT FOREST [on channel: 9036] is currently set on name approval. It can take a while until Navah Dreams sets your name “on go”. Lets say 24 hours — send an email reminder, sometimes this makes it faster. You can send it right ahead after registering and maybe you want to introduce yourself with a few words. Then you are inworld within minutes. [As soon as a copy of DREAMT FOREST is embedded in an opengrid, user names get an automatic approval there, like OSgrid, Metropolis, Francogrid …]. 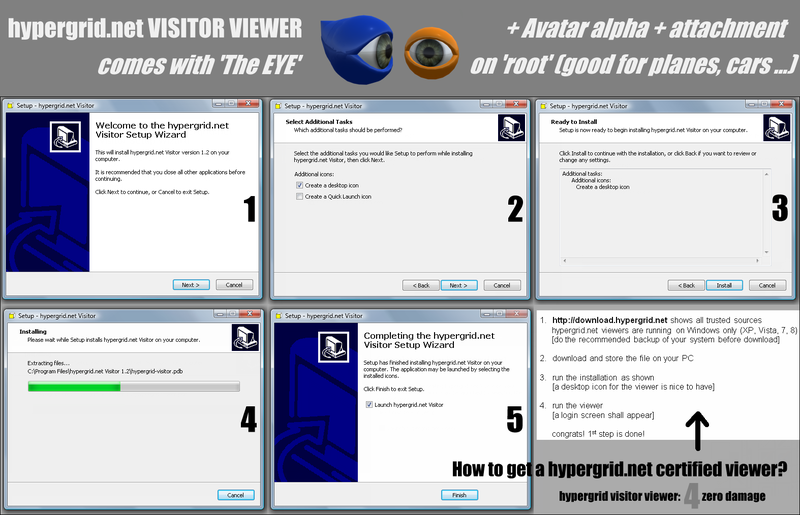 The 3D viewer: For visitors download hypergrid.net visitor viewer and install it. 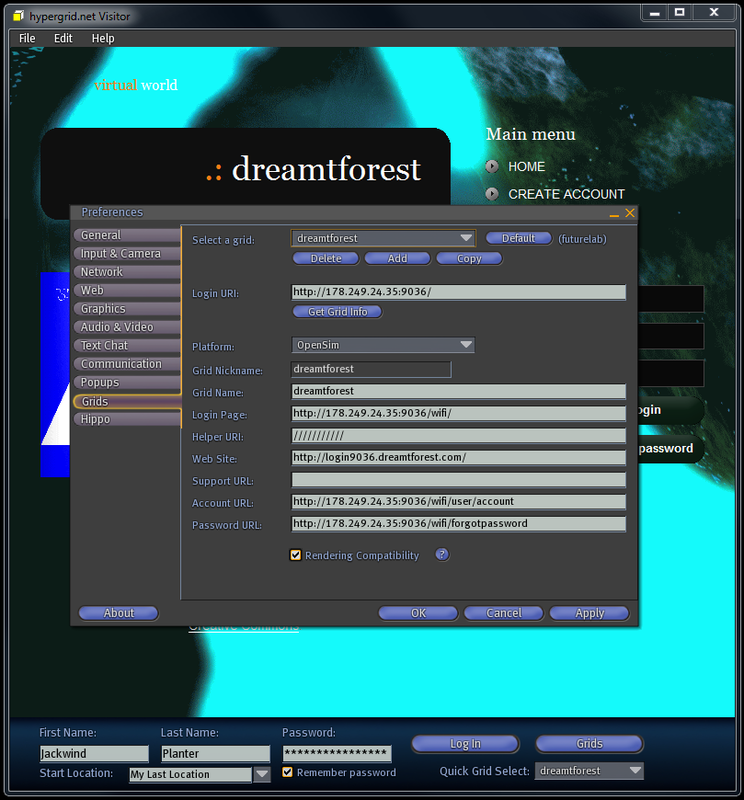 Enter your username “First name” “Lastname” and password and select grid dreamtforest. For planters download hypergrid.net viewer. 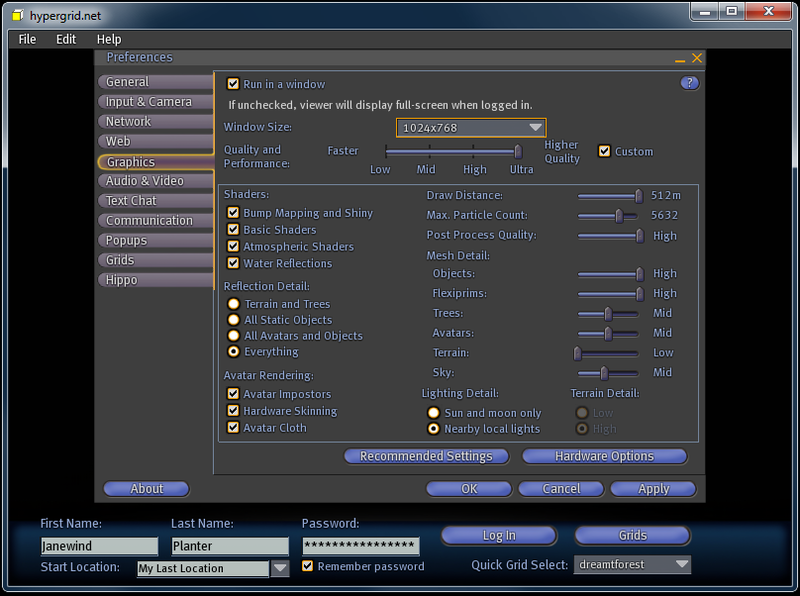 It has just more functions as the visitor viewer. You need them to rez a tree [rez=to bring into the word]. Both viewers are suited to be used at schools as they work also on a local grid offline — means you dont need internet access in the classroom. 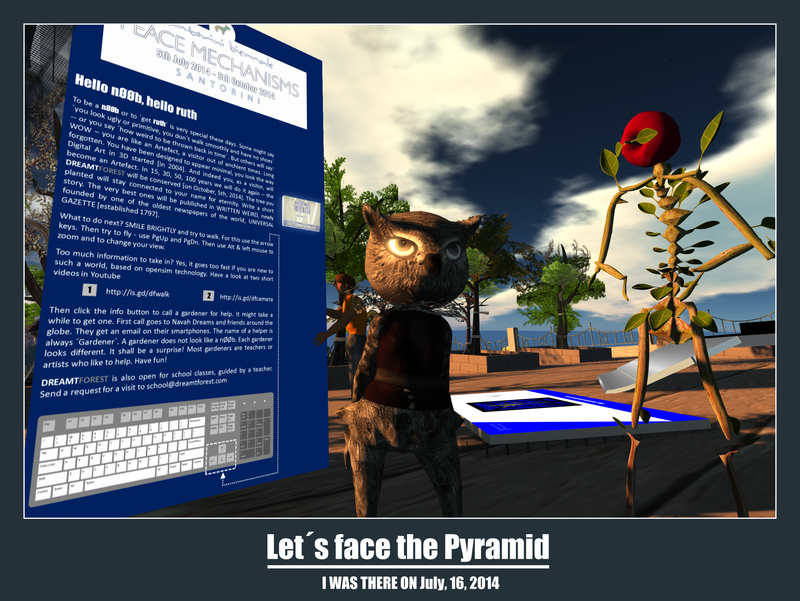 HG Safari: On July 16, 2014 the Hypergrid Safari [HG safari] was at DREAMT FOREST. Get in contact with HG safari via Facebook Thirza Ember. Thirza Ember lives in OSgrid, the home of the opensimulator developers. The HG Safari visits places of art, education and entertainment once a week, usally on Wednesdays 21.00 GMT. Even in case DREAMT FOREST might not stay on the agenda you get good company and you get the knowledge for a hyperjump. Also join Facebook Group HG Safari. There you find more screenshots done by the vistors on tour. What does it mean “Let´s fact the PYRAMID? Santorini Biennale plans a Digital Art Festival in 2015 and Art Blue will assist the curators in the category “IMMERSIV/I/A” [immersive interactive art]. How to take part will be published in rez/z/magazine and at PRYRAMID AWARD.